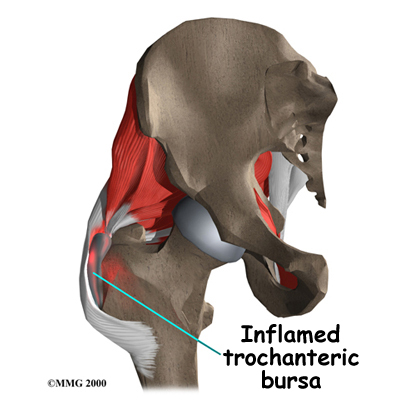 Welcome to Purposed Physical Therapy's patient resource about Trochanteric Bursitis of the Hip. Friction can build in the bursa during walking if the long tendon on the side of the thigh is tight. It is unclear what causes this tightening of the tendon. The gluteus maximus attaches to this long tendon. 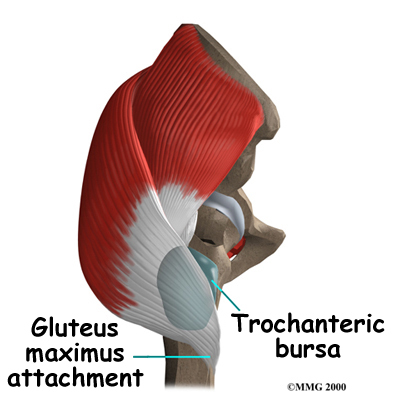 As you walk, the gluteus maximus pulls this tendon over the greater trochanter with each step. When the tendon is tight, it rubs against the bursa. The rubbing causes friction to build in the bursa, leading to irritation and inflammation. Friction can also start if the outer hip muscle (gluteus medius) is weak, if one leg is longer than the other, or if you run on banked (slanted) surfaces. At Purposed Physical Therapy, diagnosis of trochanteric bursitis begins with a history and physical examination. The physical examination will be done to determine how much stiffness you have in the hip and if you have a limp. Further physical tests may be done to rule out other causes of your hip pain. Our Physical Therapist will also want to know when the pain began and which motions cause the pain. At Purposed Physical Therapy, treatment of trochanteric bursitis usually begins with simple measures used to calm inflammation, and may include heat or ice applications. Our Physical Therapist uses hands-on treatment and stretching to help restore your full hip range of motion. 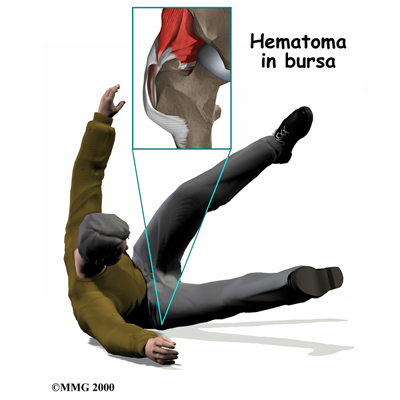 Improving strength and coordination in the buttock and hip muscles enables the femur to move in the socket smoothly and can help reduce friction on the bursa. Time required for recovery and rehabilitation varies for each patient, but as a guideline, you may expect to attend Physical Therapy sessions for four to six weeks before full motion and function return. Younger patients who have this condition because of overuse can usually be treated by reducing their activities or changing the way they do their activities. Decreased activity, combined with our exercise Physical Therapy program of stretching and strengthening, and perhaps a brief course of anti-inflammatory medications, will usually resolve the problem. Patients may also want to consult with their doctor or pharmacist regarding the use of pain relief or anti-inflammatory medication. 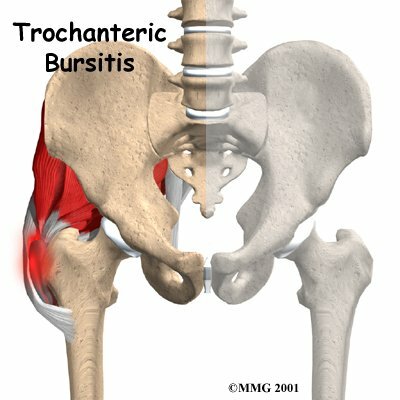 Although the vast majority of our patients with trochanteric bursitis never require surgery, if you do, the Physical Therapists at Purposed Physical Therapy can provide a personalized post-surgical Physical Therapy program to help speed your recovery so that you can more quickly return to your active lifestyle. If you have surgery, your hip will be bandaged with a well-padded dressing. Although the amount of Physical Therapy a patient needs relates to his or her own speed of recovery, as a general rule, you may expect to attend Physical Therapy sessions at Purposed Physical Therapy for up to two months after surgery. Our first few treatment sessions will focus on controlling the pain and swelling after surgery. We will then have you begin exercises that gradually stretch and strengthen the muscles around the hip joint. Our Physical Therapist will help you retrain these muscles to keep the ball of the femur moving smoothly in the socket. We will also provide you with tips on ways to do your activities without straining the hip joint. Your physician may order X-rays to make sure that there are no other abnormalities in the hip. X-rays will usually not show trochanteric bursitis. If X-rays are suggested, they are to rule out other problems that may be causing your hip pain. Sometimes it is difficult to tell whether the pain you are suffering is from trochanteric bursitis or underlying arthritis of the hip joint. An X-ray may give more information about the condition of the hip joint itself. 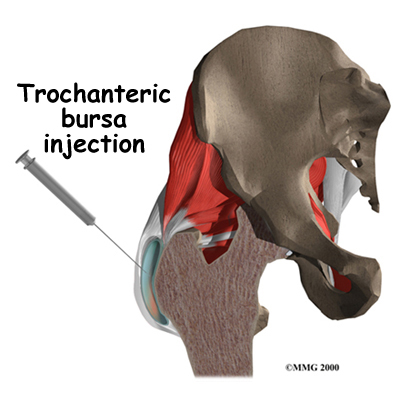 An injection of a local anesthetic into the bursa can also help your doctor diagnose trochanteric bursitis. 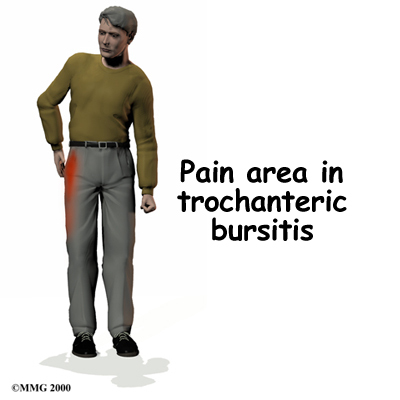 If the injection removes the pain immediately, then the diagnosis is probably trochanteric bursitis. Most physicians will also add a bit of cortisone medication to the novocaine to help treat the condition at the same time. Cortisone is a powerful anti-inflammatory medication. It can reduce swelling and pain when injected directly into the bursa. The injection will probably not cure the problem. But it may control the symptoms for months.